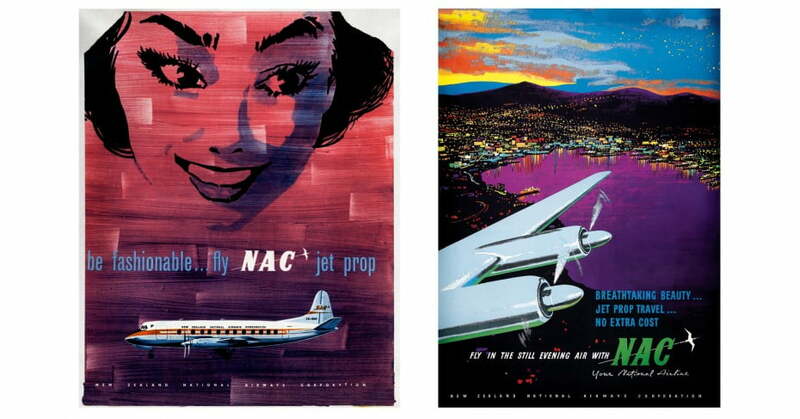 The 1970s was a colourful time for aviation advertising. As air travel became more readily available and affordable than ever before, new passengers and reasons for air travel were sought out to inspire the public and promote the airline. Sports teams, music groups, students and couples over 65 were all new potential passengers to fill the higher capacity planes. During the 70s social reform and individuality were key drivers of design. Postmodernist themes of deconstruction and mixed media ran hand-in-hand with developments in computerised technologies and photography. Ironically themes of nature spilled over from the 60s and co-existed with this. 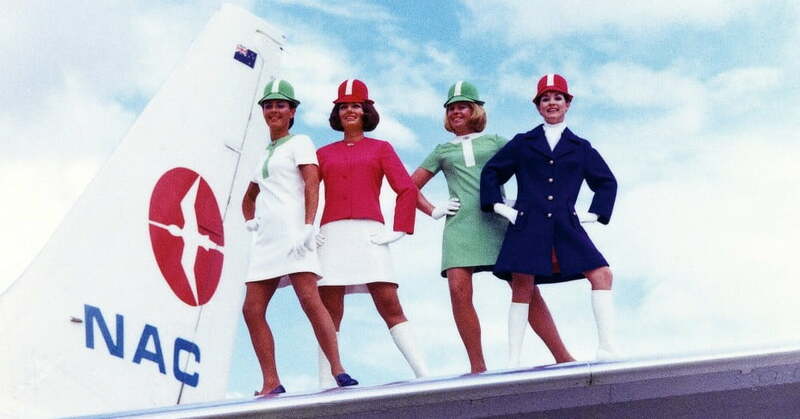 Innovative airline uniforms such as those designed by New Zealander Vinka Lucas experimented with newly developed fabrics. Age old wool was combined in new ways with synthetic fibres in support of New Zealand's main exports. This uniform was also the first to include the Koru and the sleeves featured stylised Maori design, setting it apart internationally. The 70s was the decade of the DC-10, a triumph of engineering it set a new standard in passenger comfort and inflight service. The DC-10 was a revelation in comfort for both crew and passengers, with enough space in first-class for a steward to wheel a joint of beef out on a trolley and carve it to the passenger's liking. For a country the size of New Zealand, having two Government-owned airlines was a lot to maintain. Increasing costs and growing pressure from international competitors, among numerous other logistical reasons, led to a rapid merger in 1978. The speed of the merger was fast and staff had to adjust quickly. The merger, while difficult for many at the time, ultimately created a much larger company which enabled it to go head to head with international competitors. In an effort to communicate the merger and bolster staff morale, aircraft were initially adorned with a combination of the Koru and NAC colours, with the NAC Godwit applied toward the front of the planes. On 28 November 1979, a sightseeing trip aboard an Air New Zealand DC-10 to Antarctica took a tragic turn, when Flight TE901 crashed into Mount Erebus, killing all 257 people on board. Air New Zealand's day-long sightseeing trips to Antarctica had been popular since their inception two years before, and the journey was viewed as one of the world's great sightseeing experiences. The argument over what caused the disaster was long and drawn out, and continues to this day. For a small country the size of New Zealand, the tragedy left a deep and lasting impact. Almost everyone knew someone who had lost a loved one on the mountain. Today there are memorials in Auckland and at the site of the crash on Mount Erebus. The 70s saw the end of DC-3s and Electras, replaced with the wide-bodied jet, in Air New Zealand's case the McDonnell Douglas DC-10, which broadened the possibilities for travel and tourism. The first DC-10 arrived in Auckland in 1973 with a brand new logo for the airline - the Koru. Now a much loved and easily recognisable Kiwi emblem, during the 70s it embodied the rise of New Zealand's cultural identity. Associated with strength and versatility, it further established Air New Zealand and New Zealand on the world stage. Two years later an Air New Zealand DC-10 made its first fully automatic landing at Auckland International Airport. In 1977, a DC-10 flew 235 passengers on the very first day trip to Antarctica. With the 1970s, came a versatile new air hostess uniform for NAC. The colourful new wardrobe boasted a series of four matching A-line crimplene dresses. Known as the Jellybean or Lollipop, the dresses came in spring green, cherry red and white, and were worn with a distinctive helmet-shaped hat, knee-high white boots or black loafers. For chillier temperatures, there was a navy blue wool coat with a white cravat to wear. Air New Zealand's international crew also got a new uniform in 1976, at the hand of Parisian fashion house Nina Ricci. The wardrobe change was debuted on television, followed by a week of parades and media coverage around New Zealand and Australia. A red, white and blue uniform introduced by NAC in 1976 continued to be worn by all Air New Zealand crew for a few years after the merger of the two airlines. However with rapidly changing fashions the houndstooth dress of the uniform was preferred. The scarf was updated to feature the new Koru, making the uniform a visual alliance of the two airlines and their people.